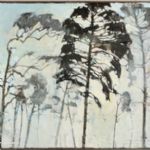 North House Gallery is delighted to present throughout the summer this evolving show of paintings and prints by ten artists: Norman Ackroyd RA, Daisy Cook, Gwenyth Fugard, Jason Hicklin RE, Melvyn King, Sara Lee Roberts, Ffiona Lewis, Sibylla Martin, Julian Meredith and Dina Southwell. 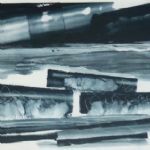 Norman Ackroyd’s etchings of the Barra Isles were inspired by visits there last summer. As always in etching, the light is represented by the white paper. 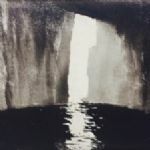 Here it is strangely almost blinding as it bursts through dark cliffs.A selection of one hundred Ackroyd etchings is available to view in the print room. 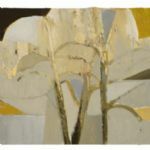 Daisy Cook’s small Summer Trees paintings are bathed in a warm, yellow light. A large painting, with a cooler but luminous atmosphere, shows a coastal landscape abstracted into Cook’s distinctive triangles and radiant arcs, an infectious way of seeing. 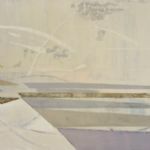 Gwenyth Fugard also places geometric constraints on her paintings, with the illusion of a window frame or by folds in the canvas, for example, before adding and erasing paint to extend her landscapes beyond the literal to something more emotional and political. 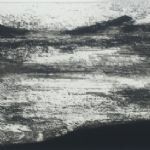 Jason Hicklin’s vigorous drawings in the landscape are translated into deeply bitten etchings in the studio, so deeply bitten in fact that the etched surface, which holds the ink, is etched away again in places, letting the light back in. The light on Coniston Water and the sea around St Kilda are recent examples. 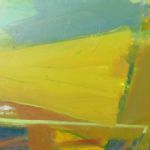 Melvyn King’s work is based in landscape with a sound underpinning of abstract design. 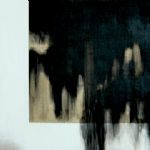 The monotypes and oil on board painting here are inspired by the light on the North Sea near Harwich. 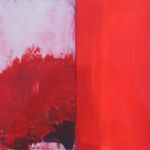 Sara Lee Roberts’ abstract acrylic paintings in black and red, retained from her successful show in April, are essays in colour and tone, suggesting light and an intimation of place. 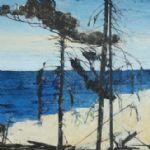 The trees in Ffiona Lewis’s paintings are bold, structural marks but her interest is as much in the spaces between the structure: looking through the trees to the sea and sky beyond. 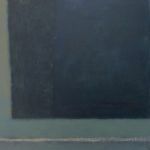 Sibylla Martin’s small abstract paintings are about colour: how it works and what it can do. 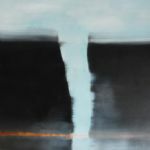 The starting point can be part of a wall or a slice of landscape, in fact anything that offers a trigger and possibilities. 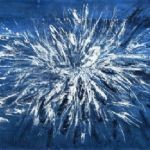 Julian Meredith’s huge monoprints using feathers represent migration. 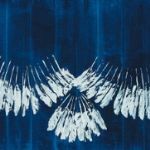 He is passionate about the relationship of birds (and other animals) to the fragile natural environment and the dangers of human intervention.Feathers is a mysterious white splash in a dark blue sea. 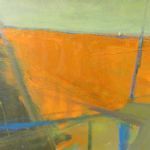 Dina Southwell’s paintings are increasingly daring in gesture and colour. 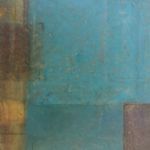 They and her new abstract collages represent intense memories of space, light, movement and especially colour relationships seen while travelling through landscape, Tuscany and Kenya in particular. Manningtree, on the estuary of the River Stour, is at its best at this time of year. There are walks, cafés and restaurants. Check the trains (an hour from Liverpool Street, at least every half hour) and make the visit.